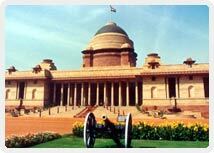 The Rashtrapati Bhavan or The Official Residence of the Head of the State is the residence of the President of India. It is located in New Delhi, India. Until 1950 it was known as ‘Viceroy's House’ and served as the residence of the Viceroy of India. This beautiful mansion has four floors, 340 rooms and covers a floor area of 200, 000 square feet. 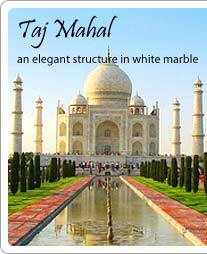 It is made up of 700 million bricks and three million cubic feet of stone. The interesting aspect of this building is that hardly any steel has been used in its construction. The Rashtrapati Bhavan is the largest residence of any Head of the State in the world. This wonderful architectural wonder situated on Raisina hill and showcases the fine blend of Mughal and Western styles of architecture and decorations. It is one of the most magnificent buildings in New Delhi designed by Sir Edwin Lutyens and Sir Herbert Baker after it was decided that the capital of India would be shifted from Calcutta to Delhi. This was announced by the King George V on 12 December 1911. The Rashtrapati Bhavan represents the Indian architectural patterns of jaalis, chhajjas, Buddhist railings and chhatris. The most prominent and distinguishing aspect of this magnificent architecture is its dome superimposed on its structure. The layout of this building is based on a massive square with many courtyards and open inner areas. There are separate wings for the Viceroy and another wing for guests. The Durbar Hall also known as the Throne Room is among most popular rooms of this palace famous for its 2 ton chandelier hanging at a height of 33 meters.